LG Innotek will be the exclusive supplier of dual-lens camera modules for Apple's "iPhone 7 Plus," expected to ship this September, a Korean report claimed on Thursday. Shipments of LG modules could begin as soon as this month, Business Korea said. The company is in fact predicted to monopolize Apple's supply of dual-lens parts for the rest of the year, though other parties could jump on board in 2017. Sony —a regular image sensor supplier for Apple —was once expected to take the lion's share of dual-lens module orders. In May, though, an analyst claimed that Sony production had been slowed by the twin setbacks of low production yields and earthquake damage at its Kumamoto facilities. Sony dismissed the idea of any disruption in image sensor production, but in actuality it might not have been able to keep up with Apple's voracious iPhone camera demands. Rumors and leaks have so far indicated that only the "7 Plus" will get a dual-lens camera, along with some other unique upgrades like 3 gigabytes of RAM and a Smart Connector. 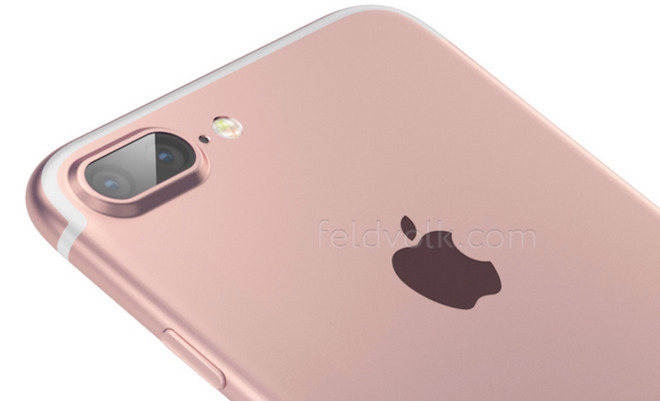 The regular "iPhone 7" may see comparatively modest improvements, though its camera may finally be enhanced with optical image stabilization, previously a Plus-only feature.